The marbled halls of the Palace of Parliament in Bucharest, the charming baroque streets of medieval Brasov, the imposing pointed towers in Vlad the Impaler’s Sighisoara, the spectacular scenery of the Transylvanian Alps – these are just some of the highlights of this fascinating tour of Romania. On this holiday you’ll find that the bustling capital, Bucharest, contrasts superbly with the fortified churches and forbidding castles of Transylvania, while Brasov will reveal the Saxon heritage of this part of Romania. There’s also the chance to experience the astonishing Fagaras pass and visit the old cultural centre of Sibiu. Day Two: Mid-morning walking tour of Bucharest. Romania’s cosmopolitan capital is well-known for its wide boulevards and fine pre-World War I buildings that gave it the name of ‘Little Paris’. The tour will concentrate on the Old Town and the Calea Victoriei – Bucharest’s most famous avenue which leads to the beautiful Romanian Athenaeum, the Royal Palace, and Revolution Square. Bucharest is also known for its stark Communist-era architecture, exemplified in Ceausescu’s monster House of the Republic, now known as the Palace of Parliament. A guided tour will show you some of the 1,100 rooms of the world’s largest civilian administrative building. Day Three: Travel north through the Southern Carpathians to Brasov, stopping en route at Bran Castle. On a rocky outcrop guarding the entrance to a mountain pass, Bran Castle lives up to the Gothic fairy tale image that Bram Stoker’s Dracula evokes. The castle was built by the Saxons in the late 14th century to defend Brasov from invasion by the Turks. Inside you’ll find displays of rich Western European furniture, which Queen Marie, granddaughter of Queen Victoria, purchased in the 1920s when the castle was used as a royal residence. Continue to Brasov for four nights bed and breakfast with dinner in a local restaurant this evening. Arrival in Brasov will be late afternoon. Your Tour Director will conduct a short orientation walk of Brasov before dinner. 126 miles today. Days Four to Six: In Brasov. 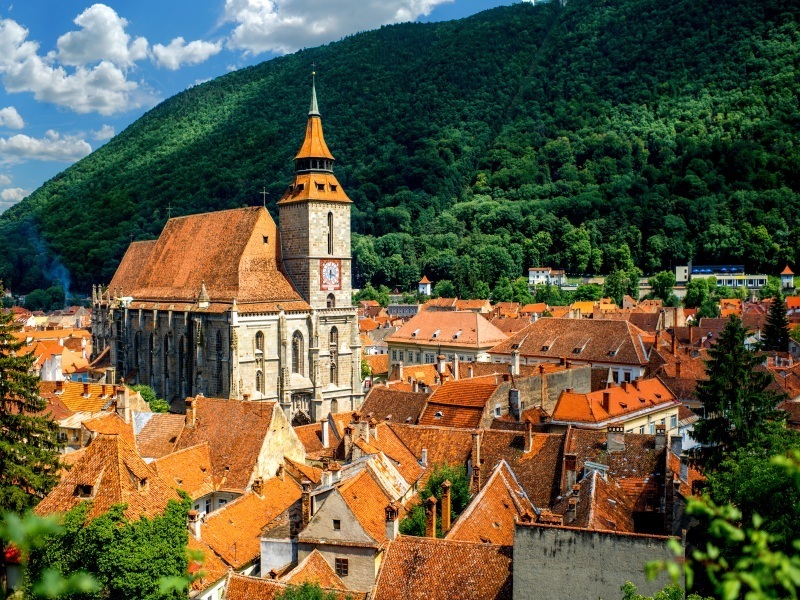 Brasov is a medieval town with ornate Saxon churches and townhouses. Local legend has it that when the Pied Piper lured away the children from Hamelin, they re-emerged near Brasov’s main square, Piata Sfatului, in the heart of the medieval quarter. It is one of the finest Baroque squares in Romania. Here you can visit the 15th century Town Hall, with its quaint Trumpeter’s Tower on top, and the Lutheran Black Church – the largest Gothic church between Vienna and Istanbul, with a 6-ton bell and a huge organ with 4000 pipes. The Romanian School Museum displays some of the first textbooks written in the Romanian language, which were printed in Brasov. There are two included excursions during your stay in Brasov. One is a full-day trip to the birthplace of Vlad the Impaler, Sighisoara, 81 miles away. Sighisoara was fortified by the Saxon guilds – the Blacksmiths’, Butchers’ and Cobblers’ are among the defensive towers which still survive and the beautifully preserved medieval citadel is on the UNESCO World Heritage List. In the belfry of the imposing Clock Tower which dates back to the 13th century, a drummer strikes every hour and every day at midnight a different wooden figure emerges. Close to the Clock Tower you’ll find the house where Vlad Dracul was born. On the return journey to Brasov, you’ll make a stop at Viscri where the Prince of Wales bought, restored and converted traditional dwellings into guesthouses. The second excursion is a pleasant half-day visit nearby to Harman and Prejmer. Under continuous threat of marauding Mongols and Turks, the Saxons not only fortified their towns, but the villages as well, with defensive works centred around the church. Two fine examples are in Harman, where the church is surrounded by a 40ft wall with seven towers and Prejmer where the church defences include bastions, drawbridges and over 270 rooms built into the outer wall in four storeys as refuge for the village’s families in times of attack. (25-mile round trip). There is also an optional excursion to Sibiu including lunch, the largest of the Saxon merchant towns. As well as a trade centre, Sibiu has always been the artistic and cultural capital of Transylvania. The former wealth of the city is evident in its grand squares, fine buildings and churches. This is a long day – it’s not that far to Sibiu, but we make a detour in both directions and get a taste of the incredible Transfagarasan mountain road, Top Gear’s ‘best road in the world’. 235 miles round trip including the detours. Day Seven: Return to Bucharest. The main stop today is the resort of Sinaia in the Bucegi Mountains 31 miles south of Brasov. Sinaia had a monastery and little else until the 1870’s when King Carol I built a summer residence here. His ornate Peles Castle, built in German Renaissance style, is richly decorated with carved wood, tapestries and oriental ceramics. Next door is the Art Nouveau Pelisor Palace, built by King Carol for his nephew and consort. After a tour of both the Castle and the Palace you have free time to visit the resort and for lunch before continuing to Bucharest (a further 90 miles) for your last night, on a bed and breakfast basis. Please note: Saturday departures spend the first and last two nights in Bucharest. The order of the programme is adjusted accordingly.